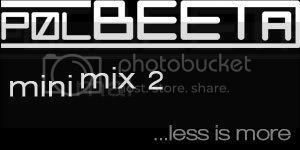 MINIMIX vol.2 by DJ POLBEETA - Welcome to City42.com � Chicago Nightlife, Chicago Events, Chicago Nightclubs, Clubs RSVP, People and Entertainment. Trippy blend of Minimal, Tech and Micro house. Second volume to already popular underground series, started in 2008. DJ POLBEETA (Dmitriy Rozental) was born in the tourism and entertainment jewel of Eastern Europe; the city on the Black Sea, Odessa. Well known for its lavish nightlife and highly praised club environment; Polbeeta started deejaying at the tender age of 12, working small school parties and events. After arriving in Chicago in 1996 he joined an already significant army of house music lovers, eventually shifting his taste to tech house and minimal sound. After a long and fruitful career in the Eastern European circles of Chicago, Polbeeta joined Sound-bar’s elite group of DJs in 2007, and acquired exclusive sponsorship from progressive nightlife website and promotional company City42.com. PolBeeta’s innovative approach to music and unlimited energy gave him a chance to play at Chicago’s Top rated night life venues and in 2008 he received a two year residency at Chicago’s largest nightclub Crobar. During his tenure at Crobar PolBeeta released a three part series: “Live at Crobar” that gained tremendous popularity in Chicago’s House and Techno circles. His true recognition for underground movement came with his famous album release “Dreaming of You” last fall, with over 2,000 CDs distributed all over Chicago and over 4,000 downloads online. His recent successes include sharing the decks with world renowned DJs: Fedde Le Grand, Robbie Rivera, BT, Morgan Page, Nick Teranova, Antoine Clamaran, Dirty South and many more. Dance music never stops evolving and expanding so neither does PolBeeta’s playlist and selections. PolBeeta’s sets are a musical exploration into the deepest parts of the human soul. He plays a well blended mix of soft minimal sounds effortlessly combined with dramatically intense tech, progressive, and vocal notes that underline the power and tenderness of the human experience. PolBeeta’s musical style matures with the culture which has allowed him to become a household name in mixing various types of electronic audio stimuli. Whether he’s rocking it out at Chicago’s Top Clubs or intimate, underground parties - Polbeeta works hard at his craft, tirelessly expanding his knowledge of the art; each song is handpicked, providing unforgettably energetic parties and events.